A military policeman stands guard in the cockpit of the MH17 airplane after the presentation of the final report into the crash of July 2014 of Malaysia Airlines flight MH17 over Ukraine, in Gilze Rijen, the Netherlands, October 13, 2015. Rosaviation, the Russian Federal Air Transport Agency, is continuing its discussions with the Netherlands concerning the Boeing crash in eastern Ukraine. The letter that the agency sent on January 14, 2016 presents six points that should emerge if the Dutch version about the BUK missile becomes official. 1. The characteristics of the fragments do not correspond to the characteristics of the 9H314M's warhead. The Dutch report says that the plane was struck with hundreds of high-speed objects from the 9H314M model's warhead (the model should not be confused with 9M38M1 series missiles, which do have warheads). According to the Almaz-Antey consortium, the producer of the BUK missile, this model has characteristically striking elements: I-beams that resemble a sectioned butterfly. Rosaviation claims that only two such striking elements were found among the fragments. Also, if initially these particles were indeed the I-beams, they lost a significant part of their mass, which is not characteristic of these warhead components. Rosaviation cites an experiment with an explosion near an airplane and says that the average loss of mass in the striking elements is 7-12 percent. However, the particles in the Dutch report lost 24-32 percent of their mass. 2. The holes in the Boeing fragments do not correspond to the holes that a 9H314M warhead makes. Almaz-Antey experts exploded an equivalent missile near the body of a plane and saw that the hull contained many holes in the form of I-beams. However, the fragments of the Malaysian Airlines plane do not contain holes with such forms according to the Rosaviation letter. 3. The known details do not correspond to the external form of the fragments of the exploded 9M38 missile. The Dutch experts concluded that the 9H314M warhead was “packed” in the 9M38 missile's body. In August 2015 Rosaviation representatives found out that the Dutch possess fragments of the missile. The Russians were shown photographs of five fragments, including a rather undamaged body part from the third section. In an experiment Almaz-Antey exploded an equivalent missile and discovered that the third and fourth sections broke up into large parts containing information about the serial number. As a result, in the letter the Rosaviation deputy director writes that the presented fragment of the third section of the missile has nothing to do with the Boeing crash. It seems that the Dutch agree, since the final report does not mention the fragment. “According to the BUK missile producer, when the 9M38 series missile approaches a plane with the corners indicated in the report, the algorithm of the radio controlled fuse detonates the warhead with a functional delay and consequently the area of the warhead's explosion would be located 3-5 meters from the plane's nose towards the keel,” the Rosaviation letter says. The final report indicates that the explosion occurred four meters above the plane's nose and slightly to the left. 5. The missile could indeed have exploded in a different place. Russian specialists concluded that in the case of such damage the explosion point would have been no more than 1.6 meters from the commander's window. 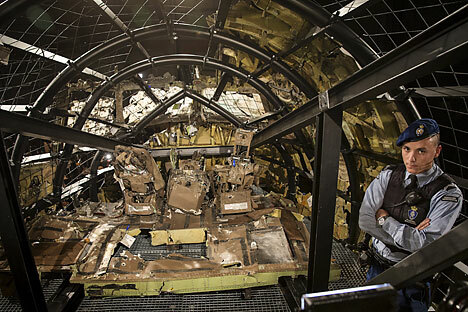 Rosaviation also criticizes the evaluation of the damage, affirming that the Dutch did not consider an entire group of airplane fragments and some were not included in the 3-D reconstruction of the fuselage. 6. The location from where the missile was launched is incorrect. Russian specialists modeled the BUK's trajectory based on the Boeing plane's damage, considering the missile's technical characteristics. It turned out that the missile could have been launched from the Zaroschenskoye settlement in the Donbass region. At the time of the plane crash this area was controlled by the Ukrainian Armed Forces. The Dutch Security Council confirmed receiving the letter from Rosaviation Deputy Director Oleg Storchak, according to council representative Sarah Ferna. Malaysian Airlines Flight MH17 (Boeing 777), flying from Amsterdam to Kuala Lumpur, was shot down over Ukraine on July 17, 2014. All 283 passengers and 15 crewmembers died.